You have a home. I’ll take it all. Preferably in small bills, in easy-to-carry suitcases, which I will collect each evening from the parking lot behind Dirty South Improv. I’m the one in the dark glasses, the pj’s, and wearing the pink carnation in my…well, wearing one. Can a Co-op be Better than This? I love “The Weave.” I love working here. I love the support I receive. So much has been accomplished in the past 20 years. There is much of which we can all feel proud. The big changes underway promise even better, even more. But, should we be content with this? Are we all that we can be? Can we be a better co-op? Should we be? Is everything as well with our “Weave” as the publicity machine would have us believe? I picked up a pamplet in our Carrboro store today. It explained why our Salad Bar prices were rising. And I suddenly realized that the pamphlet was a perfect metaphor for where our “Weave” is at the moment. I double-checked by perusing our web-site. It’s pretty. It’s catching. It uses all the right buzz phrases. And it makes me feel good about myself and my “Weave.” At least on the surface. Just like the pamphlet did. Compared with your average conventional grocery store, the icon we claim not to be, “The Weave” is doing pretty well at being socially and environmentally conscious. 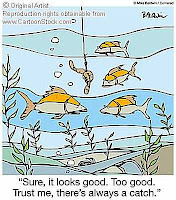 But if we look below the surface, can we claim that we are performing as well as we would like – as a co-operative food store? Do we? A Living Wage in North Carolina is pegged at about $13.32. I’m at the lowest level of grunt. I’ve been with “The Weave” three years. I entered at $9. I now get paid $10.25. And I’ve never been disciplined. Entry-level at Lowe’s Food Store is $10 for a cashier. The General Manager announced two years ago that worker wages would rise by an average of 20% over the following three years. What he forgot to mention was the fact that this would not be a straight cost-of-living raise. It would include upgrades triggered by our own increased sweat. On current course, I will indeed receive a 20% increase over the three years – entirely the consequence of my own productivity improvement. And I’m by no means the hardest worker in my little universe! Surely, we can be better than this? Do we? A social bottom line is not merely an extension of the financial bottom line into the community. Bully for us for buying local and for making community donations. Wal-Mart makes community donations. Would anyone mistake them for a co-op? So, what is a ‘vibrant social bottom line’? Primarily, a social bottom line should be inward-looking. In a co-op, it should be a blueprint for a social business model that is distinct from the ‘dollar-is-all’ attitude, the ‘hey fella, look busy’ approach to workers that one finds in most conventional grocery stores. In order to pay for all the changes currently in progress in “The Weave”, changes which perhaps you laud, our social business model is slipping dangerously close to that of Wal-Mart. The relentless pursuit of productivity is becoming more like intimidation for our workers, rather than a nurturing social business model. Workers are becoming more used to barking than asking. And our only vehicle for worker input to policy – the worker-owner program – was de-funded in 2005. Now, lest you think I’ve gone major league mushy on the prerequisites for business success, please know that modern ‘conventional’ business wisdom says that it is happy workers and happy consumers who make a happy and successful business – not, as in our case, an unending drive for more outlets, better product packaging, and clever, ‘authentic’ marketing. Once we are truly seeking the former, then we can claim we have a social bottom line. For the time being, and while we are obsessed with the latter, we are merely Harris Teeter with a recycling bin. Does this really describe us? Were we open about all of the changes currently underway – and their full consequences? If we don’t like what’s happening, as workers or consumers, just how exactly do we enforce accountability in our “Weave”? I’ve tried for three years, without success. And I’ve had some experience at this! And I mean immediate accountability. Of course, one can stand for the Board. And that’s what I’m doing. But what about everyday, touchy-feely accountability. The sort where you get to debate with the guy who moved the fish? More to the point, did we ever get a vote? Do we ever? Shouldn’t we, if we’re a co-op, if we want to distinguish ourselves from conventional capitalist corporations? Doesn’t true accountability require ‘vibrant, sustainable’ democracy in big decision-making before the fact, rather than a complaints box after? If any part of this rings bells with you; if you also feel that all is not as well with the “The Weave” as it should be; if you feel that, as a co-op, we should be better than this; then do something about it. Get involved. Take action. If you’re not already an owner, become one. Vote in the 2008 Board elections. Choose a ‘Tasty’ candidate who believes that, as a co-op, our “Weave” can be better than this. I raise these concerns only because I care. Because I truly love our “Weave.” Because I believe we have lost our way as a co-op. And because I believe that the only way that “The Weave” can return to full financial success, social ‘health’ and genuine co-operation is properly to ‘be the co-op!’ – and to have someone on the Board who champions this. But remember, this is not just about me. Or any other individual. This is about all of us. Acting together. 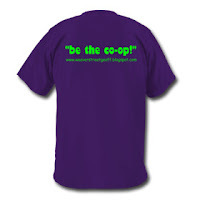 After that, it’s up to all of us then to make use of those channels to ensure that we are the best co-op that we can be. My candidacy is about giving power to the workers and the owners – where it should properly be. Because we can be better than this! Now. Philosophizing aside, feel free to pop over and say ‘hello’ anytime. I’m a friendly guy. I work on the Hot Bar in Southern Village. I’m usually the one wearing the crazy t-shirt- whether at work, or hanging out at “The Weave” after hours! 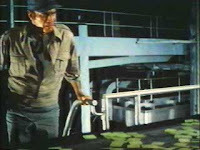 …their first product range from the new Food House will be…Soylent Green! It’s a tough decision to raise questions at a time when big changes are in the middle of being implemented. For the record, I’m one of those workers right in the middle of that ‘arena.’ I’m struggling alongside my buddies and our stressed-out managers, doing all I can successfully to implement the big changes currently underway in Weaver Street Market Co-operative. Even though I was never properly asked for my consent to these big changes, neither as an employee nor as a worker-owner. Even though my worker-owner capital is being used as collateral for the $6 million in debt that is financing the big changes – and my permission, as a worker-owner, was never sought nor given. Even though my annual dividend as a worker-owner is likely to take a hit as a result of the cost of these big changes. Even though my sweat, and the sweat of my fellow workers, for months to come, will be needed to pay off the hundreds of thousands of dollars in interest accruing on that debt. Even though I am being asked each day to work harder for less. Even through all of this, I continue each and every day to work that much harder, to ensure that these big changes succeed – because I do not want my “Weave,” our “Weave” to fail. I think my fellow workers have earned that right, too. And my fellow consumers. And my fellow owners. You put a lot at risk when you become the one who ventures to put his head above the parapet, to ask the searching questions. There is never a good time to ask searching questions. Not even if they are good searching questions. Not even if they are searching questions that are spot on. My point – and it is the point of my candidacy for the Board in 2008 – is that I would not be needing to ask these searching questions, at what is arguably a bad time, if the Board had been doing its job, and asking the right questions at the right time. We need a Board that asks those searching questions. We can be better than this! The Board: ‘Authentic’ and ‘Sustainable’? [What follows is a commentary by my sister, Maggi Gilson, still resident in the UK, and a long-time co-operator and left-of-center activist in that country. Maggi met some of you when she came to our Christmas Party, while visiting with me at Christmas. She has been closely following events with “The Weave” and its Board. Carver says that the Board is there to determine and voice the values and vision of the owners. This word values is like the words co-operative or interaction or partnership or community: no-one ever really questions it and everyone assumes they understand it and, more, that they all mean the same thing by it. Consequently it hardly ever gets examined. We all know what we’re talking about here, right? We all know what we mean by the word sky, right? Why bother stopping to take a look? I did take a look. A really good look. At everything the Board has says it does, and how it does it. And there is absolutely nothing in there that can elucidate for me what their values are. It’s all broad brush, in exactly the same way the word values is broad brush. No-one can nail them on it, because they haven’t nailed it themselves. The real problem is: what value is being expressed by the Board when they move employees whose activities are being seen, recognised, enjoyed, loved by their fellow workers and shoppers; whose work is contributing significantly to the creation of an ambience of intimacy, dedication, commitment, quality, fab food; whose presence is part of the collective pride in the high quality and service and face-to-face interaction the Board says it stands for; whose skills are being demonstrated and shared with and educating the community they serve and are (so the Board says) a vital part of, and stick them in a box on the other side of town, away from the community, away from all their fellow employees, away from the team (‘the family’) they are a part of, away from all the people they have been educating and pleasing and being rewarded by with looks of frank appreciation and smacked lips? We know what kind of value this is. It’s called restructuring in the pursuit of efficiency (read ‘costing less’) and increased profits (read ‘making more money’). If the Board is saying that it has solicited and listened to the views, the values and the vision of its owners and decided that the owners’ highest value, their number one priority, is to make more money and get bigger, then by all means, go ahead. If this is their case, then they will have to change their Articles, their Mission Statement, and their Board policies to reflect this, so that in all cases, the entire community can be absolutely clear that what has been co-operatively decided, and what the organisation’s operational choices will be guided by, is that increasing profit and efficiency will always take precedence over any other value expressed by the community in the organisation’s documention. Because on my reading of these, despite their absolute lack of specificity as to real behaviours and real activities, what those documents tell me is the following. 1. To engage in the business of selling high quality food and other products in a co-operative manner that promotes goodwill among the community. Please tell me this. ‘In a co-operative manner’ means ‘having sought and considered the views of the community’, does it not? If the Board has chosen to ignore this statement about their purposes, how do they see this side-stepping promoting the goodwill of the community? The worker-owners are members of the community. Does this move promote their goodwill? Is it an action designed to raise their enthusiasm, their eagerness to participate, their general sense of joie-de-vivre, their heartfelt desire to communicate their happiness to the rest of the community? Does it increase or decrease the total sum of human happiness in the co-operative, since that is what ‘goodwill’ is? The consumer-owners, and general shoppers, who are both member groups of the community: is their goodwill promoted by taking away the bakers, and the smell of the bread, and sending them off to the other side of town? How are we doing with this value? 2. To develop an attractive and successful model for community- and worker-ownership in food retailing and local economic development. How’ve we done? Does the Board think the community will run towards a model that has decided that profit, expansion and efficiency or of higher value than, say, community values of participation, direct contact, democratic decision-making? Do they think they’ve made it attractive by putting profit ahead of, say, the interactive, collaborative, service-inspired working practices of their bakers, their pastry people, their kitchen staff, et al? Not to mention how attractive and successful we all know it can be to work for or shop with an organisation that fails to consult us, even on its own terms. 3. To create jobs that are secure and educational and that support the dignity of all workers. Aha. Perhaps the bakers were so slobby and bad at their jobs that the Board felt it was in the interests of their dignity to put them out of sight? Or perhaps they just didn’t notice that bakers baking in front of their community actually educates everyone? Perhaps they don’t think dignity has anything to do with being recognised every day by your customers for the wonderful work you do? Perhaps the Board thinks that what their work colleagues have to learn from the bakers, and what the bakers learn from their work colleagues, and what all the workers have to learn from their customers and the community that they see and talk to every day, and vice versa, is not educational enough, provides no room for personal or community development, that standing beside an oven in a factory couldn’t do better? Perhaps it didn’t occur to the Board that, this being a people business after all, a co-operative people business at that, where you might assume that co-operating was a crucial part of the mix, that the bakers chose to work there because of the different kinds of people they get to interact with, not just because they get to learn how to bake or do it with other bakers and cooks? Does this action promote the dignity of these workers? How are we doing on this value? These are three out of the four purposes as expressed in the Bylaws. The fourth is ‘we get to do any other thing’. None of them says: our purpose is to expand, to make ourselves bigger, to be the best and most famous co-op in the country. Not one. I have to surmise from this that the organisation itself agrees on its own terms that its priority is not to maximise efficiency or increase profits. Its priorities, its most important values, are as stated here. These are what they have said they will be guided by. These are what the community has expressly agreed to when they handed decision-making on their behalf to the Board. We’ll let you decide, because these are the terms we know you’re going to be ruled by. These are the rules that the Board itself has declared will govern EVERY decision they make on the owners’ and community’s behalf. This is where they have declared they will look first to gauge whether their decision has been an appropriate one for the community they serve, and where they will look first to monitor whether what they are doing is successful in terms the community has agreed. These are the values of the organisation. These are what you get to refer back to when you wonder what the Board is doing, why the Board did it, whether it is allowed. If you don’t agree with them, get them changed. If you do, hold the Board accountable to them. I’d sack the lot of them. And under the rules, you the ownership are entitled to do just that. Not because they didn’t communicate with you or solicit your views or take your views on board, but because they have failed to do what they said, and you agreed, they would do. That is the basis on which they get to sit. If they ignore the Bylaws, or drive a cart and horses through them, they have to account to you for it. If they cannot, they go. Now, does removing all the food prep people and their activities from the store make the store more, or less, vibrant? Gosh, hard one. Another one of those words. It all depends on what you are trying to sustain. How do we decide? Are we trying to sustain goodwill and a fun place to work and a homogeneity of skills in one place and the feeling that we’re all in this together, we all matter, we all contribute to how well this place runs, we’re all continually learning, and the interactive experience of shoppers which makes Weaver Street such an interesting and fun place to go and spend your dollars on a repeat basis? That old chestnut. Again. Now, did we make this decision co-operatively? Were we guided rigorously by the views and values of the community, as declared in our charters and to which we have committed as a sacred responsibility of our Board roles? Did the control stay within the community? Or were the community completely ignored so that control could stay within the Board and be delegated straight to the General Manager? Hmmm? Dontcha love it. I’m sure someone somewhere will find a way to argue that this decision is beneficial to the bakers’ goodwill, happiness, etc etc. But will the bakers, who are the main party to this mutuality? Beneficial: how are you going to judge it? Oh, we already have. We’ve described the kinds of benefits we all agree are benefits in our purposes. Goodwill, education, dignity, co-operativity. No driving of profits there, then. At least, not our priority. 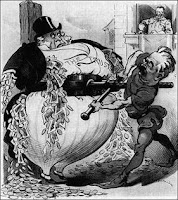 The definition of exploitation is that I take my power and I use it to make you do things because you have less power than I do and if you don’t do what I say I’ll just get someone else to do it and you will lose something of value to you, e.g. your job. How well have we managed to uphold this one? Or do the bakers have the power to say, no, this decreases our benefits, no, we won’t do this – and keep their jobs? And get to stay in the store? Now it seems to me that if you take the bakers and all the other food prep people and you hide them away in a box somewhere, you actually eradicate the community’s ability to access those people, and you seriously undermine those workers’ access to the rest of the community. I think I’d call it ‘exclusion.’ Oh, I know: we’ll set up ‘away-days’ to the bakery. By telepathy, perhaps. There’s a real pattern emerging her, I feel. Let’s do the exact opposite of what we were put here to do. It would be funny, if it weren’t. Now that the bakers are five miles away, their chances of giving and receiving and sharing information are what, exactly? By the community blog, perhaps? By the brilliant already existing WSM mechanisms for flow of information? I know I have laboured the point. The point is, the point has not been laboured enough. You do not elect or appoint Board members without nailing down exactly what your terms are, and what they mean. Those terms are imperfectly but partially formed in the Board Policies. It is the Board’s duty to hammer out exactly what they mean. As it is, the Policies already exist in a form specific enough to hold the Board accountable for these types of decisions. And according to their own Policies, this Board is way, way off beam. The beam is the Policies. And they demonstrate with as much clarity as you could hope for that the Board of Weaver Street Market Co-operative has acted contrary to its own terms. Eliza Dubose is a wonderful servant of the co-operative spirit that Weaver Street Market ought to represent. That much is clear from the support she received from Consumer-Owners in the Board Elections of 2007, and from the warm welcome she always receives from the workers at Carrboro, where she has volunteered for many years. She is the living embodiment of ‘linkage’ with all owners and workers at “The Weave,” which linkage your Board says has been its priority these past 18 months at least. As well it should be, for a Board which purports to follow the John Carver Policy Governance model. This latter point is clearly evidenced by Eliza’s dedicated and long-running interest in the affairs of your Board, and her service on two of its Task Forces. Which makes it all the more puzzling that you and your Board would turn their backs on her candidacy for the Board [Eliza put her name forward to fill a vacated position on the Board in April 2008]. The role of the Board is not to act as a support group for store management, providing skill sets to enhance its entrepreneurial adventures. That might be fitting with the Board of a conventional capitalist corporation. But not with a co-operative. And not under John Carver, which makes it abundantly clear that the primary charge of the Board is to represent the ownership, and to maintain regular linkage with it. We are heading into heavy seas at the moment. We will need the active support of all of our workers and owners safely to navigate to the other side. You don’t buttress that support by slighting one of your best ‘linkers’ and all those owners and workers who believe in her. I truly hope that you will not have lost the loyalty of Eliza, and the rest of our owners and workers who have shown increasing and useful interest these past few months – helping you and the Board to give substance to the spirit of co-operation, and its real role under John Carver. For myself, I am now convinced that your Board, as currently constituted, has lost its way. You do not properly link with owners and workers. You do not properly monitor the activities of store management. You consult with owners and workers, only to ignore the substance of their findings. You snub those few owners and workers who give of their time to link with you. You have given away too much authority to store management, who have now taken us all on a grand adventure, when some of us counseled caution as long ago as three years. That adventure is causing confusion among owners, and disenchantment among workers. Weaver Street is now grossly over-extended, going into what promises to be a severe consumer recession. We have falling sales, falling profits and rising debt. Expansion is behind schedule and over budget. We cam be better than this. No-one blames the Board for the recession. But if more had been done to consult with owners and workers, then perhaps we might have avoided some of what we now face. If the Board were to do more consulting, even now, then perhaps we might be better positioned to weather the storms ahead. I say again: you need all the help you can get. I hope you have not lost Eliza’s. I believe that the best way I can help the immediate prospects of the Co-operative we all love, and for which we all care so much, along with its longer-term vision, is to help the Board return to Carver; Weaver Market, to true co-operation; and store management, to its proper role as servant – and not master – of our ownership and workforce. I feel that I can best achieve all of that by focusing now on changing the composition and functioning of the Board. It is my strong sense that your Board and store management have lost the confidence of our ownership and workforce. I believe that your Board and store management have placed the investment of our owners in unacceptable jeopardy. Accordingly, I am withdrawing my name for consideration for the Elections Oversight Committee, and instead, I will be offering myself as a Worker-Owner candidate in the 2008 Elections for Board Director of Weaver Street Market Co-operative. As always, I take these steps only because I love working at “The Weave,” and I care about the friends I work with, and the customers that I serve. You might be interested to read the article in “The Co-operative Grocer,” which shares the challenges being faced by food co-operatives around the country (and including WSM) which are expanding their store base. Hmm. I’d love to say this is true of WSM and its expansion plans at the moment. But am I the only one that feels that owners and workers have been left out of this visioning? Shouldn’t I feel a tad more ‘cultivated,’ and just a little less un-consulted? What about less presentation, and more conversation? What about less barking, and more asking? If you genuinely and democratically ‘cultivate’ as you go along, then owners and workers truly ‘own’ the big changes, and you are less likely to have to deal with complaints about the inconveniences. This is Co-operation 101. But is it what is happening in our co-op? Or are we still being treated as if we are ‘just the store’?